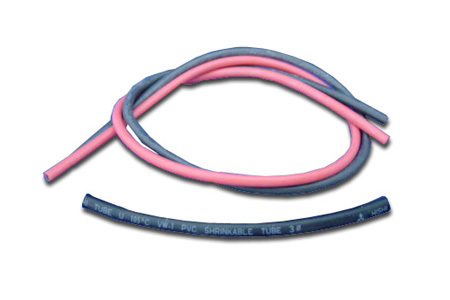 Two pieces of silicone insulated wire, good for use in any electric car. These will work for wiring batteries, motors and ESC's. 1 piece of red wire, 16 gauge, 1 foot long. 1 piece of black wire, 16 gauge, 1 foot long. 1 piece of heat shrink tubing, 1/8" diameter, 3 1/4" long.